I had a visit today from my Belgian family. My niece Morgane, her fiancé David (they met in Congo of all places) and my nephew Maxime arrived Saturday night to stay aboard and do some traveling on Sunday. We had dinner at a local Chinese restaurant which I found to be similar in some ways to those we see in the US. 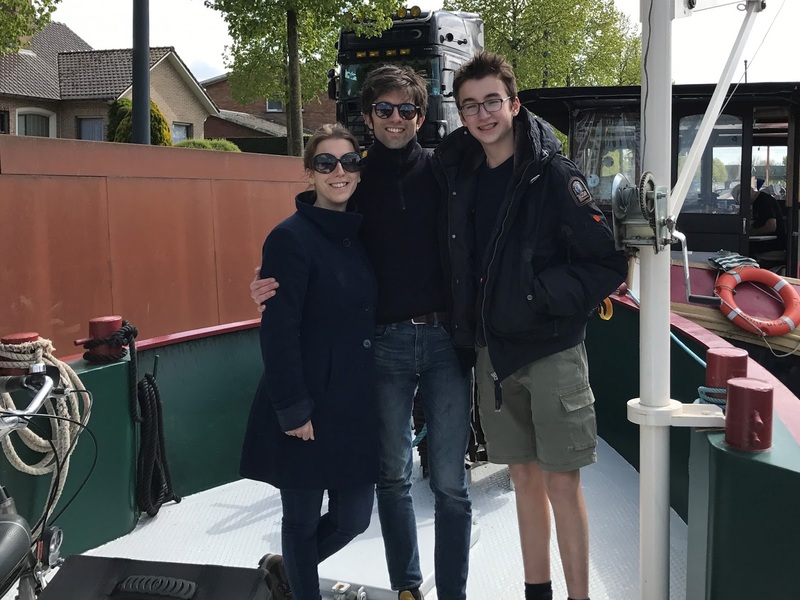 David has some experience on a boat that was owned by his family, and he did sailing mostly in the Netherlands. As a boat warming gift, he brought me an orange life ring from his previous boating times. I also received two other boat warming gifts, and these were special cookies and a large Easter egg in chocolate (note to future guests – consider my waist line please). Early on Sunday morning, I walked two blocks to a bread store which I knew to be open and I joined a queue to buy bread. Six croissants and six hard rolls. We had breakfast on the boat and about 9:30 we departed so that my guests could get their first experience with being on a barge. through a controlled bridge and to get it lifted we must call to the people that control bridges and locks. At this location, everything is done remotely. There are several cameras which allow the operators to see what is going on and when it is safe to stop road traffic and to raise the bridge. I told them that we would be returning in approximately two hours but that we would again contact them for passage. The weather was very nice for a change with lots of sunshine. Time spent on the deck was enjoyable with the warmth of the sun. 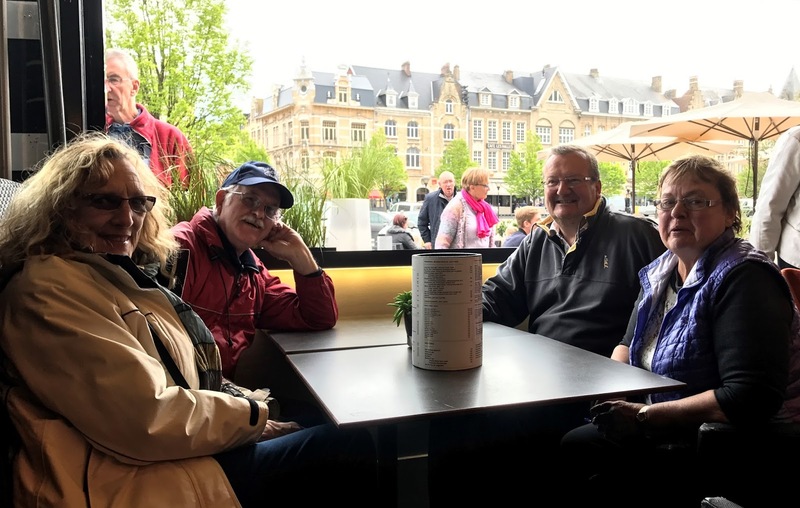 We returned to Diksmuide so that my guests could return to Brussels for other activities they had planned for this Sunday. As readers may know, bringing my boat in to its berth is always a bit of excitement. My first attempt resulted in bad placement of the boat and somehow I was able to do a 180° turn to head down the river again for another turn and another attempt at docking. This attempt went very well and I think I learned a few things. On Monday, I spent most of the day doing a simple connection of electrical wires on the boat. Why something simple takes all day is always the question. I am working with 220 V here on the boat sometimes and I have to be careful. Also the European fittings are different than what I am used to. There are no diagrams of the existing electrical system and there are also large bundles of wires visible in the engine room where connections to batteries in the solar system are located. To make a long report short, let me say that I was able to correct a wiring problem for an outlet and to add additional plug-in ports at the helm, all 220 volt. Later in the afternoon I was invited to go along for a trip to Ypres to get propane for the boat. I had just noted some gas smells on the boat and I had been told that when this is noticed, it is probably time to change the tanks. As it turns out, I don't have propane tanks but rather butane tanks and this may be a factor in the future. Butane tanks are readily available in France, but in Belgium it seems propane is the gas of choice. So my fellow travelers were able to get a tank of propane and I was out of luck. But I have a total of three tanks on board and I should be good for some time and hopefully until I get to France. not unusual to be invited on board other boats or to be included in an outing as I had today. In just the past several days I have been invited to 3 other boats for drinks or a bite to eat. Being a bachelor on my boat, I find I rather enjoy inviting others on board for a morning coffee or afternoon goûter.